James Dapogny of Ann Arbor, Michigan, is properly known as a pianist, arranger, bandleader, jazz scholar, culinary explorer, and wit, among other things. This performance comes from a magical concert of January 10, 2015, at the Kerrytown Concert House in Ann Arbor, blessedly captured by Laura Beth Wyman. The superb players are Mike Karoub, cello; Rod McDonald, guitar; Kurt Krahnke, string bass. For more from this concert, click here for uplifting performances of THAT OLD FEELING, RUSSIAN LULLABY, and MY DADDY ROCKS ME. And there is more to come. Posted in "Thanks A Million", Bliss!, Generosities, Ideal Places, Irreplaceable, It's A Mystery, It's All True, Jazz Titans, Mmmmmmmmmmmmm!, Pay Attention!, Swing You Cats!, That Was Fun!, The Heroes Among Us, The Real Thing, The Things We Love, Wow! I’ve always heard that attorneys only ask questions to which they know the answers. I have nothing against them individually or as a group, but this seems like a closed loop of an endeavor. The tenor saxophonist Lena Bloch is on a more inspiring track: she asks questions for which there might be no simple answer, no single answer. Asking the question is the purpose and the rewarding result. I have been admiring her musical inquiries as often as possible during the last few years our paths have intersected in New York City, and have seen her as a very authentic player — someone devoted to melodic explorations that, while gentle, have weight and seriousness to balance off their soaring possibilities. 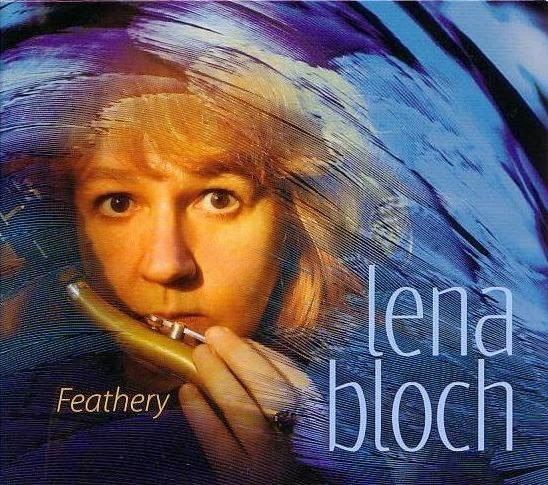 Lena has a wonderful new CD, FEATHERY — it’s her debut CD as a leader, and as you read this it will be available, as a physical CD or as downloads, with sound samples, here. Should you prefer to voyage up the Amazon, you can ask your own questions and purchase a copy here. It’s on Thirteenth Note Records, and Lena’s curious, inventive colleagues are drummer Billy Mintz, string bassist Cameron Brown, guitarist Dave Miller. Knowing can easily be confused with wisdom. Lena Bloch, Dave Miller, Cameron Brown, and Billy Mintz are deeply aware that real wisdom is in the tireless asking of questions, not an irritable straining to come up with the one right answer. Their willingness to inquire, this gentle wondering, informs their music. Rather than treat this grouping of players and voices as it usually is done (ensemble line, solos, drum fours, ensemble), they often take the opportunity to ask questions of the music itself. The music created by these four artists is far more subtle and affecting than hearing another jazz quartet working its own variations on Playing What We Already Know. The art – for let us call it by its right name – is feathery-light and durable. I hear Lester Young and Brahms, sorrows and exultations, Eastern meditation and collective invention. The music is strong and sweet, dense and welcoming. The musicians have sensations to share with us, secrets made tangible, their language too deep for words. Lena Bloch does not announce herself as courageous, and I think she would start giggling if you told her this was the case. But she surely is. Her artistic courage is not a matter of being big, bold, and loud. She approaches the music with tender reverence. But she is not afraid to venture into new spaces in pursuit of beauty. Her models and mentors knew that the cosmos could be dark and terrifying, but the only human response to the void was to speak, through playing and composing, know how to keep terrors at bay. I will fill the air with floating sounds. I will be brave enough to say WHO IS OUT THERE? I will soar above on feathers of melody. Lena’s friends and colleagues on this disc are equally inspired. They trust themselves, and their loving energy comes through in every note sounded. They fly happily. No sun dares to melt their wings. And the music on this disc continues to resonate once the disc has concluded. Billy, Dave, and Cameron are great painters of sound. They listen to their hearts; they listen to their instruments; they listen to each other. They create a world where Beauty is not only possible, but inevitable. Their sounds will guide us into the darkness and into the light. Hear them, and be uplifted. I’m not the only one who admires Lena’s questing spirit and FEATHERY: here is Dan McCleneghan’s review in All About Jazz. Once you’ve visited Lena’s website and seen more of the videos there, once you’ve heard FEATHERY, you could attend a quartet gig at the most convivial of spaces, The Drawing Room, on 56 Willoughby Street in Brooklyn, New York: Sunday, March 30, at 7:30, and the group will be Lena, Putter Smith, string bass; Dave Miller, and Billy Mintz. Whatever ways you can, find and find out more about Lena Bloch. I won’t be able to attend this gig — for which I am sorry — so I expect a goodly number of eager JAZZ LIVES readers will make up for my absence. I can assure you that the music will be rewarding. Sunday, June 10th Underground Works at Sycamore is proud to present Lena Bloch, Billy Mintz, Dave Miller, in TRIO IMPROVISATIONS. Born in Moscow, Russia, Lena Bloch has traveled the world since 1990, performing as a bandleader in Germany, Holland, Italy, Slovenia, and the United States. She has been active on the New York jazz scene since 2008, performing with musicians like George Schuller, Cameron Brown, Scott Wendholt, Sumi Tonooka, Roberta Piket, Bertha Hope, Vishnu Wood, Michael Kanan, Putter Smith… With her international cultural background and early classical training, Lena is working towards a truly unique style. Her trio with two outstanding musicians, Dave Miller and Billy Mintz, presents freely-improvised, original and jazz standard-based material, Warne Marsh, Lee Konitz, and Ted Brown’s compositions. Sets are at 8:30 and 10, with a $10 suggested donation (all proceeds go to the performers). Sycamore is located at 1118 Cortelyou Rd., Ditmas Park, Brooklyn. I haven’t managed to make it to as many of Lena’s gigs as I would like, but I made a special effort to get to this one: at a new club, Somethin’ Jazz (very nice!) on East 52nd Street between Second and Third Avenues, a ten-dollar cover and a ten-dollar minimum, with a new group for Lena — guitarist Dave Miller, drummer Billy Mintz, and bassist Putter Smith. (With this group, she will be recording her debut CD, UNFOREHEARD.) On the final two performances of this evening, pianist Roberta Piket sat in, most eloquently. The music created wasn’t a reheating of the familiar. In fact, the first two selections were floating inquiries rather than boxed-in statements of formulas, and I felt that the musicians had embarked on improvisational journeys even when the chord structures beneath the performances were familiar. Lena guided the group but was also a gentle participant who didn’t demand the prerogatives of A Leader. Each song embodied a gentle communal awareness, with a crucial openness-to-experience that we could feel. Billy Mintz is a revelation. My drumming heroes of the past and present keep time, create colors, and drive the band forward — all noble aspirations. Although Billy is intuitively connected to the rhythms that the band might float on, he is never mechanical, never content to create predictable patterns. He struck me most strongly as thinking of what color, what texture, would best fit the situation — making it happen and then moving on to something new, never entrapping himself or the band. He is soft-spoken and intent in person, equally so at the drums. Like Dave and Putter, he is poetic without being showy, generous yet spare. All I will say about Roberta Piket is that I want to hear her play more and again: she has a great deal of technique and accuracy, but it never dominates her music. Her soloing and accompaniment were elegant but not fussy; she added so much without calling attention to herself. Lena was free and brave, questing towards something whose name she might not have known, but getting somewhere satisfying — whether humming almost in a whisper, echoing the songs of a mythological bird, or showing that she, too, could follow the Tristano – Konitz – Marsh – Brown path without being hemmed in by its rules and obligations. At the end of the evening, I felt as if I had witnessed art both translucent and powerful, with echoes of Lester Young and Brahms, of Eastern meditation and collective invention: strong but never harsh, sweetly fulfilling in its desire to ask questions without worrying about conclusions. Some of my more “traditionally-minded” readers might think this music more open-ended than they would like . . . and they are free, as always, to recall Chaucer’s gentle encouragement to choose another page. But if they embrace the bravery that animates the jazz they so love, I invite them to choose a performance based on “familiar chord changes” and start there. I predict that open-hearted listening will make their hearts more light and more full. Here is the music that made me write the elated words you have, I hope, read. These musicians take us with them on their voyages. I am exceedingly grateful. Posted in "Thanks A Million", Bliss!, Ideal Places, Irreplaceable, Jazz Titans, Pay Attention!, Swing You Cats!, The Heroes Among Us, The Real Thing, The Things We Love, Wow!